All controls deriving from ItemsControl have a DataTemplate that specifies how an object bound to an item is presented to the user. 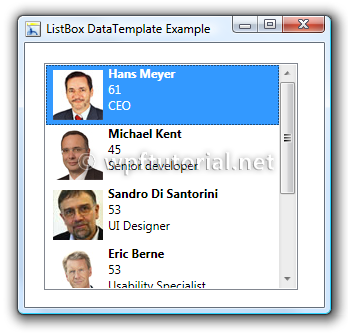 The default template renders a single line of text per item - as we know a listbox from HTML or WinForms. But WPF allows us to put whatever we like into a DataTemplate. If we want to display a list of customers we can provide a data template that shows an image for each customer next to its name and age. In my opinion this is one of the most powerful features in WPF. We bind a list of employees to the listbox. Because the listbox does not know anything about our employee class, it calls the ToString() method. The result is not yet very pleasing. What we do next is to overriding the ToString() method to provide some useful information instead of just the type name. But a string is not really what we call a cool user experience. The ultimate flexibility is to create your own DataTemplate. A data template can consist of multiple controls like images, textblocks, etc. It han have a flexible width and height, background color and shape. There are no limits for your creativity. An easy way to create a data template is to use Expression Blend. Open the context menu of your list box and choose "Edit Other Templates" -> "Edit Generated Items" -> "Create Empty". 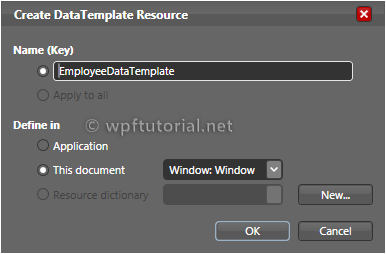 Blend will ask you to specify a name for your DataTemplate because it will define it in the resources of either the Application, the current document of an external resource dictionary. The name you specify is the key for the resource dictionary. 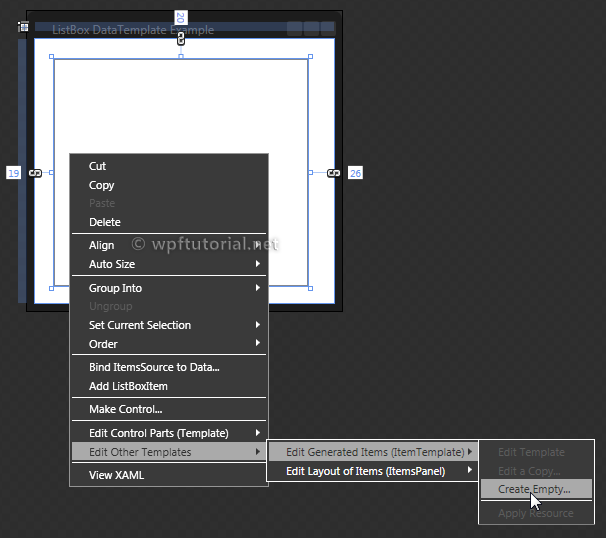 After you press OK, you will be in the editor to design the data template. The item data (in our sample an employee) is set to the DataContext, so you can easily access all properties of the employee by using databinding. The screen shots on this page are a bit hard to view. Could they be replaced? Yeah, It's really helpful, I like the way it's explain.. thx! I had some problem trying to get this one to work. I suspect people are having problems with this example because there's no data to bind to... Maybe a code snippet that populates a collection when the form loads. This would also reinforce data binding concepts and implementation. This is funny. I've spent several days searching how to bind data to a listbox. Of all the brilliant authors on the web, not one has the same solution and none make sense. I saw all of these examples in MSDN before,but the good things is that if it's the first time you want to learn that concept ,it will be more easier to start from here. \"We bind a list of employees to the listbox\"... WHERE? I have understood DataTemplate, but how it is used as itemSource of ListBox? Also how it is binded to Employee objects? assuming there is such property as Employees but it does not work (for me at least). A good example to create a data template for a beginner. 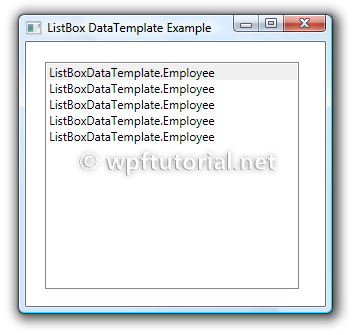 But how to set the template to the listbox. !! !Can't find the menuitem of Edit Other Templates!!! W. Are you right clicking? The example isn't to teach you how to bind data. He has other examples for that. What is left out of the example is telling your itemscontrol to use your DataTemplate. You can bind by setting the ItemSource of the ItemsControl. I generally bind in the code... if x:Name="MyControl" then in the code MyControl.ItemsSource where ItemsSource is an Observable collection of the object you want to use. Very nice example!! Keep it up! I couldnt get it to work until my class in the Observable collection had public access properties (inside of directly accessing "public string Name" for example). When I did that it worked. Hope this helps. would there be any sample for same..? though it looks like gud sample but may be difficult for a beginner..
How would you bind the data template to XML in C#? 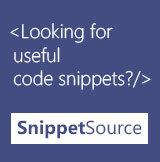 Sir,would you please paste the complete version of source code here instead of some code snippet. I think that would be more helpful. Thanks! yep. paste the complete Source Code! Please! Thanks for the stuff and great explanation.